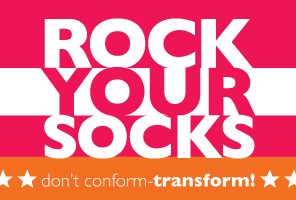 LittleMissMatched declares THIS Friday, October 21st National "Rock Your Socks" Day ! In celebration of this day, throughout the month of SOCKtober (October), LittleMissMatched will be donating funds to support creative projects in local schools across the country through DonorsChoose.org. From earthworm gardens to tumbling mats, classic novel collections to theatre supplies, LMM will support kid's creativity everywhere. Roo and I are longtime fans of LittleMissMatched and their mission to spread creativity and fun. To that end, we are proud to support them by celebrating Rock Your Socks Day. Join us on Friday (and every day!) by dressing to express the special style that is yours and yours alone. Feel free to mix and match or mis-match to your heart's content! Color-coordinate or clash- it's all about you. Take advantage of special deals like a free campaign button with every purchase, flat rate shipping on orders of any size and the incredibly adorable (and perfect for hostess-gifting!) Knee Highs Holiday Pack which features 6 single girls knee-high socks that don't match, but perfectly coordinate. 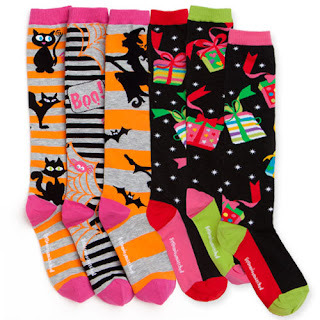 To enter and win a super fantastic surprise gift pack of assorted socks (adult womens' size) to mix or match as your heart desires, please comment on this post with your favorite item from LittleMissMatched AND how you're planning to celebrate Rock Your Socks Day. Entries will be accepted through October 29th and I'll pick the winner using Random.org. US readers are eligible. In accordance to the FTC Guidelines and the WOMMA Code of Ethics, I am disclosing that we received some socks to celebrate with and that I am using the majority of them for the giveaway. All opinions are, as usual, strictly my own. I am an adult female and I wear socks of all kinds on a daily basis! and their "Peace,Love and Happiness"
Bundle and a favorite of mine! I also follow @superdumb on Twitter. I love the women's flannel pajamas from Littlemissmatched. I celebrated Rock Your Socks day by wearing my warmest pair of socks to keep my feet warm on this gray chilly day. I love the Comfy Colorblock Confetti Socks. I rocked some blue striped socks on NRYSD.